There are number of ways one can organize and sort files on Windows 7 computer. 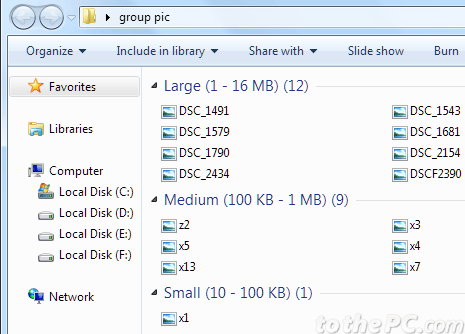 Sorting files by increasing or decreasing size is most common way to organize files in a folder. You can refine this further by grouping files as: large, medium and small. This provide quick view of number of files which are “large, medium or small” in one glance at folder contents. 1. Open any folder containing multiple files. 2. Right click on empty space in folder and goto Group by > Size. 3. Files will be sorted and organized in different rows / columns as large, medium and small. You can easily sort files in a folder using above procedure. 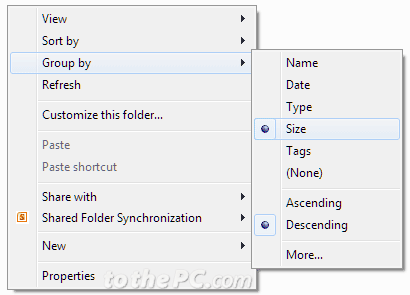 You can implement similar routine to sort folders by size on your Windows computer.